After a lot of printer time, the Hydrofoil is finally all printed and glued together. The mast, fuselage and wings are still separated for laminating although the mast and fuselage will be laminated in carbon cloth together for strength. The wings will be bolted on so they can be changed if needed. The total weight of all the printed parts is 952g so just under one reel of PLA filament or around £20 worth. Not bad! I want too make sure the designer of this foil gets due credit as he was kind enough to post his foil on GrabCad here, his name is Prof. Michele Fiorentino. I took his design and then split it into the main part files which I could then cut using Slic3R for my printer. If you would like these individual .STL files I have made them available here. If you print at 100% it should be the right size. I printed 3 or 4 pieces at a time and then glued up using CA glue. What printer did you use? Very nice. I’m doing the same, currently printing. Did you laminate yet? Hoping to laminate next weekend. Have got some 200g carbon cloth. The surface of the print will need to be touched up a lot to make sure it adheres well. We will be starting with the wings and then will decide if we need to vacuum bag the mast or not. Please let us know how it flies. I want to build one for beginners. Still thinking if it’s possible to avoid the mess with the CF & resin coating. Maybe printed with PETG and 20% carbonfibres to get 100 MPa instead of 40 with PLA? Maybe insert commercial carbon tubes for reinforcement in mast, fuselage and wings? Not sure yet. Any ideas? Best wishes for a successful finish. We are working on a redesign for some of the reasons you mention above. I printed the mast in PLA and even without any additional reenforcement it was extremely stiff. The redesign includes two 5mm diameter holes (1 front and 1 rear) to allow for the insertion of carbon rods. This will make it both easier to align parts as you glue the sections together as well as providing strength. The main issue is going to be strengthening the mast to fuselage join and the top of the mast where it meets the board. 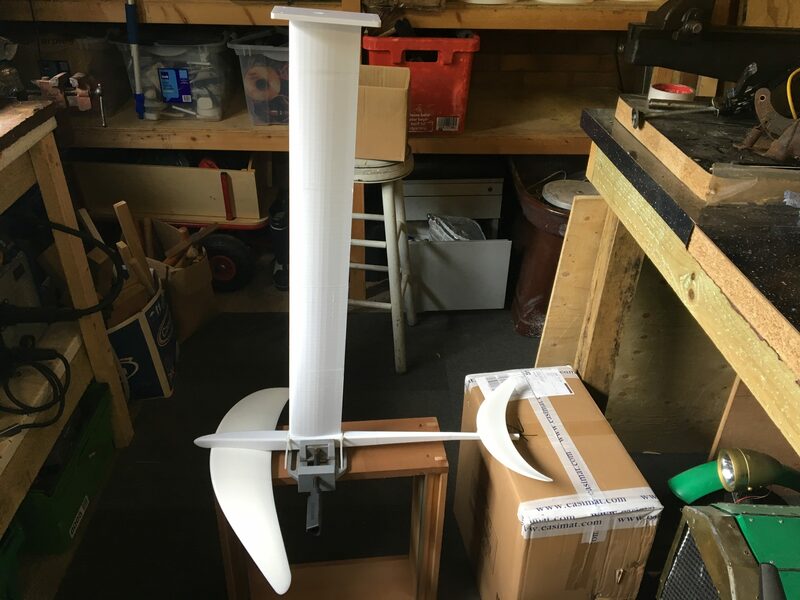 I’m playing around at the moment to look at making the whole motor/gearbox mounting part of the mast/fuselage itself and avoiding having to have a separate fuselage. I’ll post details once we have something. Hi there! This is an amazing design, I’m currently printing a foil made by a different person but I prefer your design as a whole. I’m not up to speed with using CAD software (or any editing softwarw) etc. I would love to be able to download your “split” .STL files so I can just use my slicer and print without modifying the files. I have a large print area (x 500mm , y 300mm z 270mm). looking at how you’ve your segments I will be able to print them with out any issues. I Look forward to hearing back from you from New Zealand.